P: so is it fair to say that creativity has been present all your life? Me: well, not really, I mean. Sometimes. P: okay, so most of your life? Me: yeah, okay. I guess really, sure. Me: okay yes, I've had creativity present throughout most of my life. Okay, all of it that I remember. This conversation did start my brain tossing neurons around remembering times when I didn't write, for example. Oh, but when I wasn't writing creatively, meaning fiction and poetry, I was Newsletter Editor and Staff Writer for the college newspaper, a women's crisis center, a drama troupe (two of those, actually) and then at my Office Manager job at an alternative health care clinic - and more. Oh, and when I wasn't being stage manager/director/assistant director/poster designer/general tech crew, etc for a play but I was writing skits for a child abuse prevention drama troupe and learning to throw pottery and making silk paintings and silk scarves. 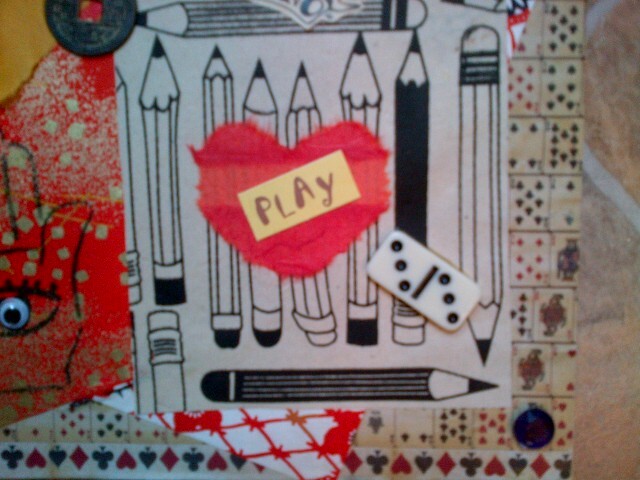 Then I was making visual art. And crafts. Then I was doing theatre. And making music when I played the piano. Playing other people's music and making up my own when I felt like it. Or working in the yard and completely redoing the structure and the plants and making a cement sun walkway from the street across the grassy area to the house. I guess creativity *has* always been present in my life nearly as far back as I remember. Coloring within the lines, though not always. Making mud pies - yes, I really did. "Flying" by jumping off the neighbor's picnic table with sheets tied around our waists, wrists, holding them over our head. Writing my first book, all 72 pages by hand, when I was ten years old; my first play for my class at age nine. Learning piano (thanks, mom) and violin and being in the orchestra; second chair in Junior Symphony. Taking up cello one year when we didn't have one; viola another year when we were missing that instrument. School plays, community plays. 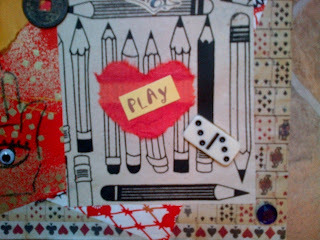 Collage and clay and sketches and making sand candles and scrapbooks. Teenage angst poetry and short stories and more sketches. Speech team and drama and choir and and and. Now let me take a little time to integrate. Creativity - not just writing, although writing has probably had the longest running engagement in my life. As much as I remember, anyway. Unless you count the mud pies. Yes. I've carried my creativity with me everywhere. I promise to look at it more often and bring it out, or at least not hide it. Because creativity is me and creativity is my blood and my bones and I don't have to hide it. Creativity is breathing for me. And we all know that deep breathing is calming and restorative. This gives me a lot to think about. You've really dissected creativity for me. And you've really done the spectrum! I've always thought my only "creative" bursts were writing, and then only the serious attempts not the teenage angst ridden poems, or vaudeville etc. Thank you for your comments, Jo! Vaudeville definitely counts as a creative activity. Oh, yes. *smile* And I know - isn't it funny how we get stuck with our limiting ideas of what does or does not count as creativity?